I get it. I do. What else are we supposed to wear? Raw meat on our heads, like Lady Gaga, as a way to pay homage to the Indian Packing Company, the canned meat business who gave The Pack money and jerseys in the early days? If I had to choose, I see why they decided to go with cheese. For one thing, meathead isn’t a very endearing term. For another, it would look even weirder. And most importantly, Wisconsin does in fact have a long history in cheese making – especially cheddar. Wisconsin’s legacy in cheese making began when European immigrants started to move into the area and realized how great it was for farming (dairy included). Because there was so much milk being produced, the farmers logically began using the extra milk for cheese making. According to the book Wisconsin Cheese: A Cookbook and Guide to Cheeses of Wisconsin, before 1850, almost all of the cheese made in Wisconsin was cheddar. Today, it is still the top producer in the country of cheddar cheese, which is the considered the most popular type in the United States and maybe the world. In recent years, there has been one kind of Wisconsin cheddar cheese in particular that has been getting a huge following – and that’s aged cheddar. On Larry Meiller’s Wisconsin Public Radio show on July 26, his guest Jeenee Carpenter from Wisconsin Cheese Originals said that there has been a “renaissance of small farmstead artisan cheese plants” in Wisconsin over the past 10 years. In fact, Carpenter noted that 43 new dairy plants have opened since 2004. These artisans are doing everything from the breeding and caring for the animals, milking the cows, and making the cheese themselves. This could account for the increased interest in aged cheddar rather then the typical mass-produced “young” cheddar sold at most grocery stores. In order to be considered “aged,” cheddar needs to sit for at least 60 days. Jeremy, the cheese guru at Foster Cheese Haus out of Osseo, told me that as cheese ages, the texture becomes more dry and crumbly and it develops a sharp, rich, nutty flavor. At Foster, you can buy young cheddar cheeses of all flavors, including cajun, vegetable, jalapeno pepper, and smoked, but there are many options of aged cheddar as well. When I was recently there, I saw cheeses aged 1, 3, 6, 7, 10, and 12 years. Most of these were made by Hook’s Cheese Company, who is especially known for their 15-year aged cheddar. This cheese is so famous that when they release the yearly batch around Thanksgiving, it will be completely sold out by Christmas. 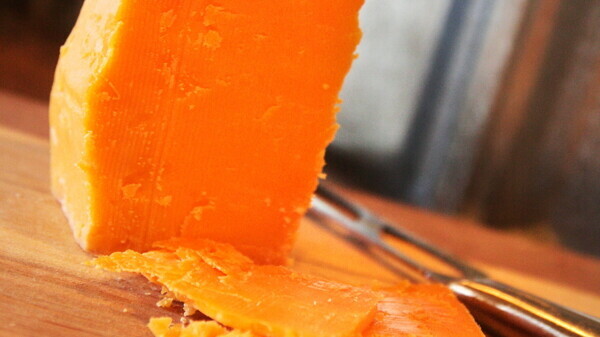 Most of the aged cheddar sold at Foster Cheese Haus and other cheese houses is the orange cheddar that Wisconsin is famous for. It’s hard to imagine life without beer and/or cheese. In fact, just typing those last words makes our native Wisconsin blood boil – after all, beer and cheese are right behind brats, sauerkraut, and a distaste for salad in the Wisconsin food pyramid, right? Come with us, as we explore these important issues.